A transit of Venus was followed within 5 hours by a total solar eclipse, the shortest such interval in recorded history. Joseph and Etienne Montgolfier first demonstrated flight of a hot air balloon (no passengers) in the marketplace at Annonay, France. Their balloon (called a Montgolfiere) lifted 6,562 feet into the air, the invention that began the conquest of space. French opera singer Mme. Elisabeth Thible became the first woman to fly, in a hot air balloon over Lyon, France. M. Wolf and A. Schwassmann discovered asteroid #456 Abnoba. M. Wolf discovered asteroid #894 Erda. The first rocket powered glider flight in the US was made by W. C. Swan. C. Jackson discovered asteroid #2066 Palala. Arthur Murray flew the X-1A rocket plane to a record 27374 meters. He encountered the same instability as Yeager had, but at Mach 1.97. Murray recovered control after tumbling 6100 m down to 20130 m.
USSR made the unsuccessful first attempt to launch a Molniya communications satellite. At T+104 sec, tank draining of core Block A failed due to a servo-motor throttle jam and break down of the motor's circuit. The launcher was destroyed on impact. The US Navy launched the Transit 9 navigation satellite into orbit from Point Arguello, California. In the final X-24A flight, the experimental lifting body airplane had a maximum speed of 867 kph, a maximum altitude of 16581 m, and a flight time of 517 seconds. USSR launched Cosmos 426 into orbit for investigation of the upper atmosphere and outer space. The mission studied charged particle flows and cosmic radiation. E. Bowell discovered asteroids #2494 Inge, #2797 Teucer, #2870 Haupt, #3169 Ostro and #3726. 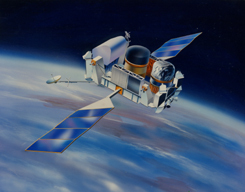 USSR launched Okean 3 into orbit for gathering up-to-date oceanographic information and data on ice conditions in the interests of the Soviet economy and international cooperation. Okean 3 ceased working in January 1994. The first Ariane 5 booster was launched with four Cluster Earth-observation platforms. The vehicle went off course because of reuse of Ariane 4 software, and was destroyed by range safety. NASA's STS 91 (Discovery) docked at the Russian Mir space station, the first time Discovery had visited the space outpost, during the ninth (final) Shuttle-Mir docking mission. NASA's Compton Gamma Ray Observatory re-entered the Earth's atmosphere when it was de-orbited after more than nine years in space. The Compton Gamma Ray Observatory was the second of NASA's Great Observatories. Compton, at 17 tons, was the heaviest astrophysical payload ever flown at the time of its launch on 5 April 1991 aboard the space shuttle Atlantis, and deployed into orbit on 7 April. Compton was safely deorbited and re-entered the Earth's atmosphere on 4 June 2000. Compton had four instruments that covered an unprecedented six decades of the electromagnetic spectrum, from 30 keV to 30 GeV. In order of increasing spectral energy coverage, these instruments were the Burst And Transient Source Experiment (BATSE), the Oriented Scintillation Spectrometer Experiment (OSSE), the Imaging Compton Telescope (COMPTEL), and the Energetic Gamma Ray Experiment Telescope (EGRET). For each of the instruments, an improvement in sensitivity of better than a factor of ten was realized over previous missions. The Observatory was named in honor of Dr. Arthur Holly Compton, who won the Nobel prize in physics for work on scattering of high energy photons by electrons - a process central to the gamma ray detection techniques of all four instruments. Russia launched the Cosmos 2398 navigation satellite into orbit from Plesetsk.